Holy comic book collection, Batman! Academy Award winning actor, Nicolas Cage, liquidated his comic book collection of 400 rare books this past week for the incredible sum of $1.6 million. Cage, nephew of renowned director Francis Ford Coppola, has appeared in such films as Peggy Sue Got Married (1986), The Rock (1996), Con Air (1997), City of Angels (1998) and won the Oscar for his performance in Leaving Las Vegas (1995). Cage, linked to various comic book film adaptations in recent years, wasn't present at the auction which took place at the Dallas Comicon Thursday. Included in the "Nic Cage Collection" were various key issues. Amongst them were these Golden Age treasures: Action Comics # 1 (origin & 1st app. of Superman), the "Allentown" copy of Detective # 33, plus "Mile High" copies of All-Star # 3, (1st app. Justice Society of America), Adventure Comics # 48 (1st app. Hourman) and Captain America Comics # 1. Silver Age books included: Amazing Fantasy # 15 (1st app. Spider-Man), Brave and the Bold # 28 (Intro JSA), Fantastic Four # 1, Green Lantern # 1, and X-Men # 1 - plus many others. The man of steel's debut in Action Comics #1 sold for $86,250 while Detective # 38 (featuring the first appearance of Batman's sidekick, Robin) sold for an astounding $132,250. Born Nicolas Coppola, but not wishing to ride on the coattails of his family name to attain success in the film industry, he changed his last name from Coppola to Cage. This name was inspired by "Luke Cage, Hero for Hire" who was Cage’s favorite superhero. 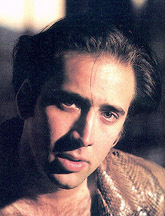 As stated above, Cage’s name has been mentioned in various comic-to-film adaptations over the years. Starting with Marvel's "Iron Man" project that never got off the drawing board, he decided to tackle the role of "Superman" that was being penned by director and comic fan, Kevin Smith. The project, after changing directors and script, was eventually shelved due to the massive budget involved. Next for Cage was the project "Ghost Rider" that was to be directed by Stephen Norrington and penned by David Goyer (both of "Blade" fame). Again, the deal fell through and Cage would seek out other projects. Recently, there was even discussions for him to be cast as the Green Goblin in "Spider-Man." Has Cage’s inability to be cast in any such comic-related film soured his interest in the genre? Considering he’s on Hollywood's A-list and recently married Lisa Marie Presley, he certainly isn’t hurting for cash. Received an email informing me that Cage has not lost interest in the genre. No, he sold his beloved collection to make his now "ex-wife" happy. Cage has stated that Lisa Marie was "too demanding" after just three months. "She didn't just want me, she wanted my soul," Cage said and admitted he parted with his vintage collection just to keep his wife happy. "I refuse to be blackmailed," Cage stated. "I'm choosing independence. I should have stood up to her from the start." Thanks to ITV.com for the scoop.